With cover art and illustrations by AG Ford, Ms. Nolen’s book is colorful, bright and imaginative (Photo courtesy of Kirkus Reviews). Special Education teacher Ms. Jerdine Nolen has been making headlines, garnering awards and nominations with her charming and inspiring children’s books. With imaginative plot lines and characters like a farmer who grows balloons and a girl whose best friend is a dragon, Ms. Nolen’s stories embody the joy with which she approaches her career as an educator. 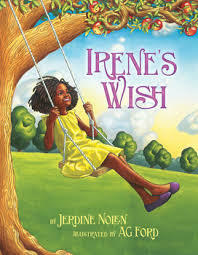 With over two dozen picture books and one novel already published, Ms. Nolen’s newest work, Irene’s Wish, was released on Oct. 28. Like everyone else, Ms. Nolen was excited for the release of her story. Irene’s Wish is a modern fable written in the tradition of the Brothers Grimm. It tells the tale of a young girl named Irene who makes a wish that her father, a busy farmer, would spend more time with her. Lo and behold, Irene’s wish comes true when her father swallows a watermelon seed that grows inside his stomach, transforming him into a tree so that he is always at home with his family. However, Irene misses her real father and must find some way to undo her wish and bring him back. Ms. Nolen is a decorated author, having won awards like the Maryland Black-Eyed Susan Award, the Show Me Readers Award from the Missouri Association of School Libraries, and the Christopher Award for her book Raising Dragons. Her most renowned story, Harvey Potter’s Balloon Farm, was both an ALA Notable Book and an IRA-CBC Children’s Choice. Her first novel, Eliza’s Freedom Road, was nominated for an NAACP Image Award in 2012, whereupon Ms. Nolen attended a red-carpet event at the Shrine Auditorium in Los Angeles, CA with her son Matthew Harold, a Mt. Hebron graduate. Despite the widespread recognition, Ms. Nolen is humbled by the accolades and focuses instead on the fact that writing has been one of the great joys of her life since she was a young girl. “I can’t remember a time when I wasn’t writing and collecting words. My mother encouraged me to do that,” Ms. Nolen reflected. She has always enjoyed stringing words together to create stories to share with her friends and family. Ms. Nolen says that she believes her books are about possibilities. By approaching an idea in an open-minded way, she is able to take inspiration from her own life and create a story that, while fictional and imaginary, represents truths that readers will be able to identify with. When asked about the message in Irene’s Wish, Ms. Nolen described how she gave the idea a great deal of thought before she even began writing, allowing it to “percolate,” like an old-fashioned coffee pot. Even so, she stated her belief that all forms of art send a message. However, she clarified that the power of interpreting that message does not lie with the writer. “It is up to the reader to decide,” Ms. Nolen commented. Ms. Nolen is currently giving some thought to writing her second novel, and she acknowledges that like any worthwhile enterprise, it takes patience and hard work. “It is like sculpting or ‘puzzling’ the pieces together in a way so the words on the page have enough life, so that they could stand up and walk around all on their own,” Ms. Nolen explained. Irene’s Wish received an overwhelmingly positive response from Kirkus Reviews, and it is certain that her future works will continue to inspire readers and their families.